The author of this book subtitled “My desertion, court-martial, and forty year imprisonment in North Korea,” was an old worn out man in his late sixties, living on an island off the coast of Japan at the time this book was written. How the author got to Japan from rural North Carolina, after spending forty years in North Korea is an amazing tale of survival. When I picked up the book and read the dust cover, I asked myself what in the hell was this guy thinking? The dust cover describes how Jenkins a twenty four year old U.S. Army sergeant abandoned his hunter/killer squad in 1965, while patrolling the DMZ in South Korea. Jenkins didn’t want to go to Viet Nam with his unit when they were scheduled to rotate out of South Korea. It was late at night and Jenkins had no idea where he was going, until he stumbled into a North Korean Army outpost. This was the start of his forty year nightmare in North Korea. The book is a fascinating account of those forty years in a hell that he describes as a giant prison country. As an American deserter, he lived well considering that North Koreans were starving and living in less than third world conditions. In North Korea Jenkins lives with three other American Army deserters that crossed the DMZ before he did. He describes the miserable lives they have working in North Korea, making propaganda movies and teaching English to North Korean military cadets. Two of these deserters died of natural causes and one of them was still alive in North Korea at the time Jenkins wrote his book. 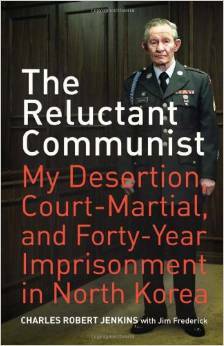 The last remaining deserter was described by Jenkins as a “stooge” for the North Koreans. Jenkins acted in several propaganda movies for the North Koreans, but insists that he was not a communist. His best known role in North Korea was as the Captain of the U.S.S. Enterprise, during the 1968 U.S.S. Pueblo incident in which the North Koreans seized the U.S.S. Pueblo in what they claim was North Korean waters. As you get into the book, you begin to realize that Jenkins may not be a deserter or turncoat, just some poor dumb country boy that screwed up real bad while trying to find a way out of the U.S. Army. North Korea did not exist when George Orwell wrote 1984. If it did I´m sure that he would have used North Korea as the model for the fictional country in his book. The Reluctant Communist is not a book about the military. It’s a book about a man that may have had a drinking problem, was afraid and confused and made a mistake that he paid for by spending forty years in the strangest and most isolated country in the world. If Jenkins had gone to Canada or another friendly country as a lot of American deserters did at that time, he would have never spent forty years in a U.S. military prison. I would recommend this book to anyone that is interested in North Korea, or to someone that wants a good read about a man and his miserable experience that is so strange that it could not be fiction.